Description: I couldn’t make a decision if I’d use the space for a big bookshelf or a bed, big enough for two guest because I really needed both. I built a frame to hide the upright modified bed and attached it to the wall. 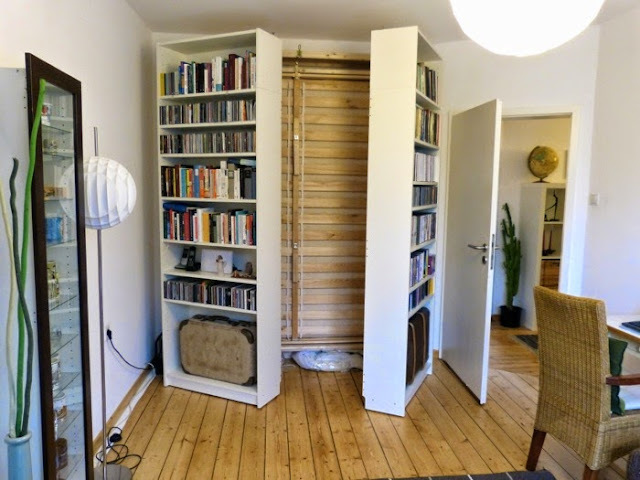 The BILLY-bookshelves are on wheels and open like doors. The pictures show better how it works! What kind of wheels did you use and how did you install them for the billy book cases to look like they are sitting on the floor directly? 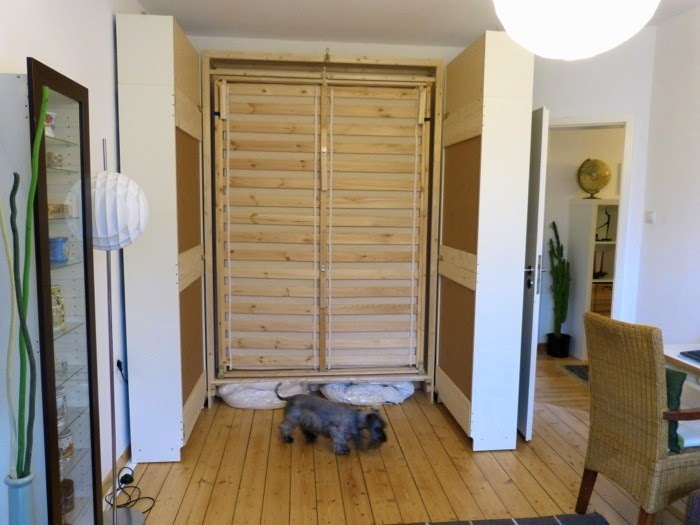 I wish my landlord and I had thought of this before we built and installed my Murphy bed. It makes sense for the space, I have no space for books. Hi, I see that you have been asked several time for more instructions, would it be possible to get that. I need to build something that is cheap and easy (it looks doable to me). I think this is awesome!!!! And some people are nuts! Do they honestly think you are going to close the bookcases and shut somebody up in there? where do these people live any way? Your idea inspires me very much. Thanks for the great tip! What kind of wheels did you mount on this? Where did you purchase them? Thanks! I found some on ebay, super inexpensive. Can you post step by step instructions on how you were able to complete this? 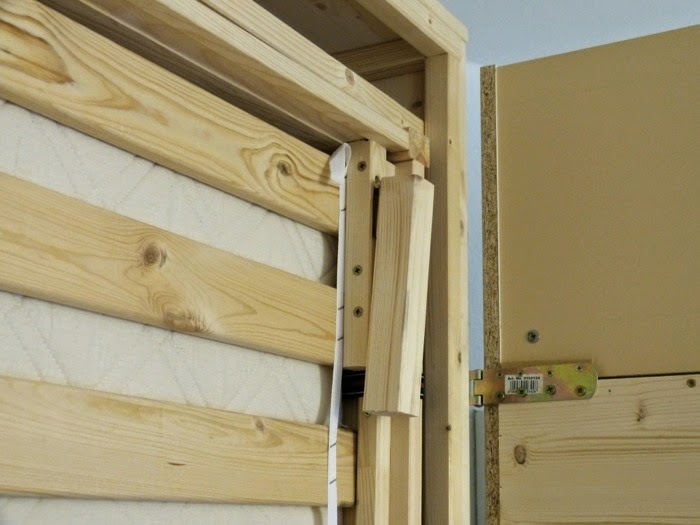 Did you have to purchase an additional murphy bed mount kit? I would like to know how heavy or hard it is to pull down and then lift the bed? Would need this for elderly person. Thanks. It looks like a great idea. It is easier than I thougt. My girlfriend is very small and light but she can do easily. For smaller people I would recommend to put the fixation (when the bed is up) lower. I love it! 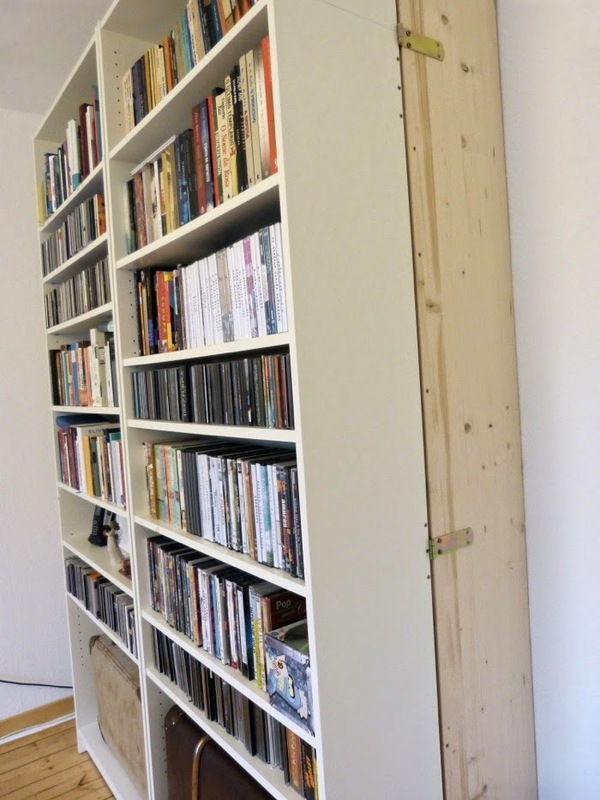 You could even make a false front for one of the shelves on each case and cut out the back board so that whoever is sleeping in there has a bedside table sort of thing, maybe with some strip lighting or push lights, where they can put an alarm clock, or their phone, or their glasses. That would be cool. I would decorate the backs of the cases with some interesting fabric, so the sides aren’t rough for sleepers. Bonjour, j’aimerais fabriquer le même que vous je suis de France, pourriez vous m’aider? I bet your guests don’t stay long. It must be like sleeping in a cave. They have to shunt down to the foot of the bed just to get up. Clever use of space though! Or they could sleep the other way round, feet in the ‘cave’!?! please provide more details-this is an amazing hack! 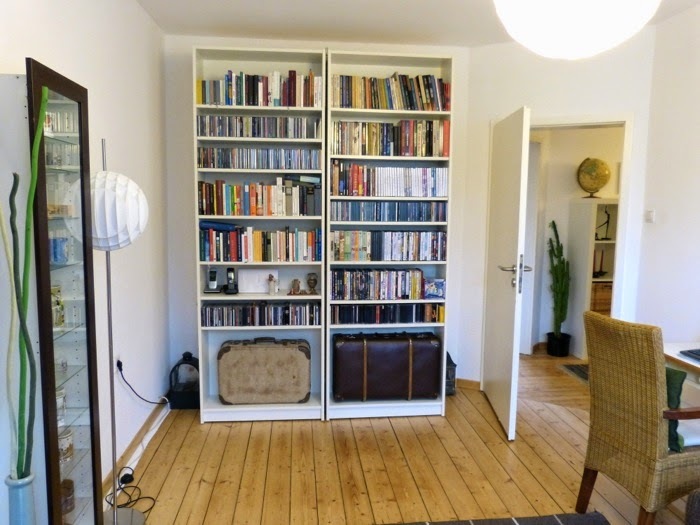 Is the full weight of the bookshelf put on hinges? Isn’t it heavy to open? The BILLYS have wheels mounted to them, so there’s no weight the hinges have to actually hold, they just keep the BILLYS in place, so to say. I’d guess the hinges used in this hack couldn’t hold the weight of an empty bookshelf but since they’re not meant to anyway, it’s just fine to use them. Can you post more photos of how you mounted the bed? This is amazing.